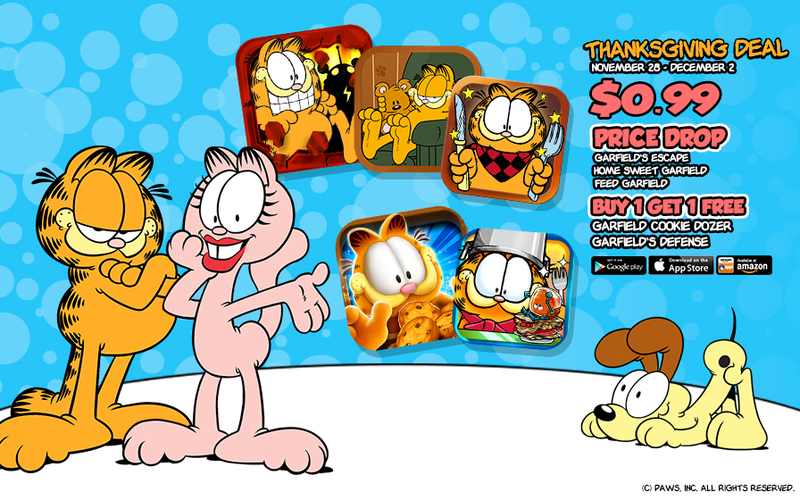 Home » Android » Garfield welcomes thanksgiving with red hot deals! Garfield wants to thank all his fans, so he’s giving away awesome deals for his games across three mobile platforms. Have a fun Thanksgiving with Web Prancer and Garfield’s red hot deals! Enjoy huge discounts on Garfield’s Escape, Home Sweet Garfield, and Feed Garfield, or take advantage of Garfield’s Buy 1 Get 1 FREE promo. From now right until the end of Cyber Monday, buy any amount of cookies for Garfield Cookie Dozer and Garfield’s Defense, and get the same amount, FREE! Have a sumptuous Thanksgiving feast with Garfield and his friends! Click on the links below to find Web Prancer apps for each store, or visit our products page for a full list.